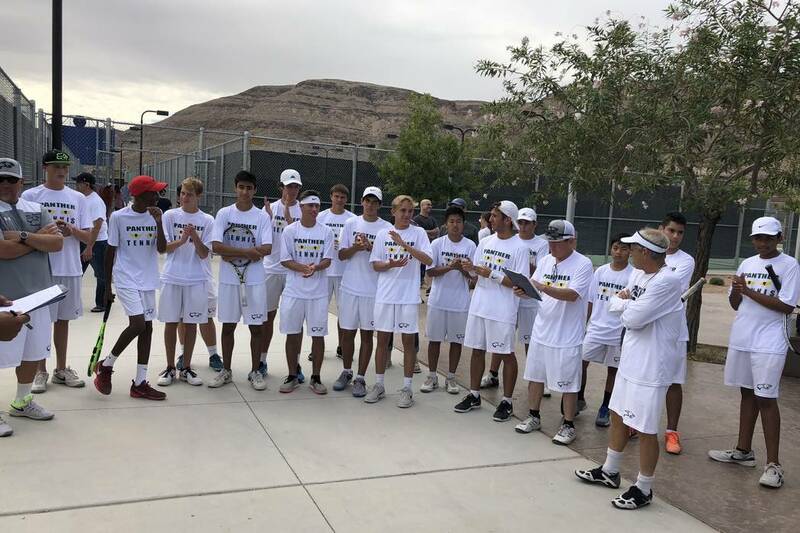 The defending state champion Panthers rolled to a 13-5 win over Clark at Bishop Gorman to claim the ever Southern Nevada boys tennis team championship — and perhaps, more importantly, the region’s bye in the six-team Class 4A state tournament, which begins Oct. 15. Palo Verde boys tennis coach Richard Coop didn’t quite now how to react to his team’s victory on Saturday morning. Befitting, because the victory is the first of its kind. The defending state champion Panthers rolled to a 13-5 win over Clark at Bishop Gorman to claim the first Southern Nevada boys tennis team championship — and perhaps, more importantly, the region’s bye in the six-team Class 4A state tournament, which begins Oct. 15. Michael Andre was 3-0 in singles for Palo Verde (17-0). Jack Kostrinksy and Axel Botticelli both were 2-0 in singles, and the doubles team of Denim Richardson and Tyler Juhasz was 2-0 for the Panthers. Richardson was pleased with how his team performed and said he’s looking forward to state tournament, which contests the semifinals and finals in Reno this year. Simran Shah and Rahul Gupte were 3-0 in doubles for the Chargers (15-1), who played without three of their top players for undisclosed reasons. Coop wasn’t concerned with Clark’s lineup, though, and is prepared for a possible rematch at state.